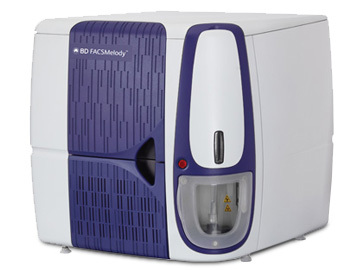 The BD FACS Melody is a small and efficient cell sorter intended for relatively simple sorting applications Our Melody is configured with blue (488 nm), yellow-green (561 nm), and violet (405 nm) lasers plus photomultiplier tubes for the detection of up to 8 fluorescent parameters, including common fluorophores like EGFP and mCherry along with dead cell discrimination markers like DAPI or live dead aqua. The Melody has a similar flow cell and sorting chamber design to BDs popular FACS Aria, however, improvements in the nozzle design have enabled faster threshold rates and sorting speeds, while still operating at low pressure (23 PSI). The instrument is capable of sorting into multi-well plates for common cloning assays and also into 5 mL tubes for bulk sorts where only 2 gated populations may be collected at any time. In the short-term, the instrument will not be housed inside a biosafety cabinet. Instead, it is equipped with an aerosol containment unit (AMO) that provides a measure of safety for operators protecting them from potential hazards as long as established aerosol containment SOPs are closely followed. In the future, a small biosafety enclosure will be acquired to further enhance operator safety and sample sterility. Until then, samples handled with good aseptic technique will not have compromised sterility. The new BD FACSChorus software, is very straightforward and easy to learn and we will now train qualified users to sort their own samples (without operator assistance). This service will become available in March of 2018. Until then, the instrument will be run an operator-assisted basis, which will always remain an option for those who do not want to run their own sorts. Before training is requested, clients should consult with one of our operators to discuss their potential use of this instrument. Individual access to this instrument will only be granted to senior researchers who have already been trained in flow cytometry by U of T FCF staff. These persons must be able to demonstrate a good understanding of flow cytometric principles (including cells sorting theory), and have established a good track record of responsibility when working on our other cytometers. Please refer to the instruments page for the downloadable configuration PDF. Cells should be concentrated to a maximum concentration of 8 million cells/mL. Large cell lines should be concentrated to a max of 5 million/mL since sorting large sticky cells can be difficult. Preparing a solution with DNAse to prevent aggregation. Increasing the concentration of EDTA in the buffer (up to a maximum of 5mM) to reduce aggregation. * Loading clumpy cells onto the sorter will lead to clogs and poor sorting outcomes. Note: No sorting of cells in the lysis buffer should take place on this instrument. Please reserve an operator and the FACS Aria for this type of experiment.